That's Kate, one of my best friends. I hope she doesn't mind being on the blog. She was the lucky recipient of this cashmere scarf and I'm so glad she was able to come to my graduation! I now officially have a Bachelor of Music in Clarinet Performance. 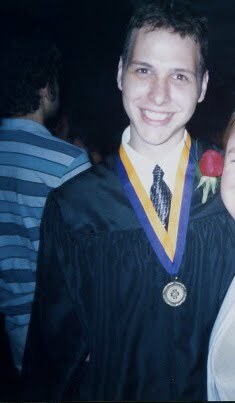 It's interesting to look back four years to my high school graduation to see how things have changed. Of course, most of the changes aren't visible. Four years is really a short amount of time in the grand scheme of things, but between the ages of 18 and 22, a whole lot of changes take place. It is during this time that one really begins to develop him/herself as an individual, to make decisions regarding who they want to be, how they act, what they believe... New experiences fly past like meteors, each leaving a streak as it goes past. The visible effects may disappear in a split second, but the memories remain. Over time, these brush strokes paint a new landscape, one that remains unseen, but can be felt and experienced. It is in this new landscape - painted by the brushstrokes of experience - that I walk now, eager to discover what will appear on the next canvas. What scene will Bali produce? Grad school? Beyond? What an amazing mystery. College has now been freshly hung in the expansive hall that is my life, but the future is sure to hold countess more paintings to line the corridors, soon producing a veritable gallery of life. Seen only by the artist, felt by the subject, and observed from the outside by the rest of the world. Congratulations Peter! Life is such an adventure....I'm glad you already realize this and are looking forward to the next chapter. I look forward to reading about your adventures. And...Kate is a lucky young woman...that scarf is magnificent! I have the pattern and the yarn but had some trouble (twice) getting a good start on it...and had to frog. The cashmere wasn't liking being ripped so I have it all in timeout right now. Congratulations! I think some of those changes ARE visible... young men generally grow during those years, in height and stature (unlike women who are generally done a few years earlier), and like the rest of us in ourselves. Plus there's that whole benefit of your brain being more fully developed by 22 (it's true! it's true!). Peter, I needed some happy today. Thank you for delivering. I'm looking forward to having you in the same time zone so that maybe our paths will cross sometime in the next few years. Peter Congratulations. I wish you love, laughter and success as you travel through the next chapter of your life and beyond. Congratulations! I hope you continue to share bits and pieces of your new and continually growing gallery of life. Congrats!!!!!!!!!!!!!!!! Trust me, even though it was torturous sometimes, you'll miss it, I know I do constantly. There was a type of freedom in college that you don't have in the "real world." Soo happy for you!!!!!!! Yay!!! Congratulations, Peter! How exciting, and scary, and fatabulous at the same time. Ya done good. Yay! I'm so excited for you. Congratulations! and good luck with your trip this summer. Whoa. You have changed in four years. Enjoyed reading your thoughts on this big transition in your life. Well done and God speed. Congratulations Peter! Best wishes & good luck as you continue on your life journey!